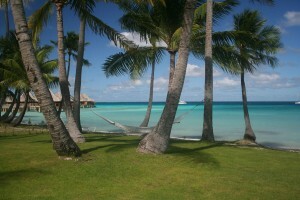 I really enjoyed Rangiroa! We stayed on the motu where the airport was located. At one end is the Avatoru Pass, it is also the name of the “main” village. There’s a few shops there which include a snack bar and supermarket. The other end of this motu is where we stayed and it is near the Tiputa Pass. This is where the lagoon and Pacific ocean meet. At times the water flows into the lagoon at up to 5 knots. It’s a good bike ride, about 5 miles, from one end of the motu to the other. On the road you will pass 2 Pearl Farms, a few restaurants/shops, and FP’s only winery. I loved staying near the Tiputa pass because of the dolphins. Just before the sun would set, every night, we’d walk to Pension Les Relais de Josephine (see the main French Polynesia page for advice on hotels vs. pensions) If the tide was right we would sit on the deck with a cold cocktail and a bowl of coconut strips and watch the dolphins jumping and playing in the waves. This was the best way to watch the dolphins. Next to the pension there is a public park on the pass where you can sit and watch the spectacular show. Note lunch at Josephine’s was great, fresh fish and/or quiche! One of the best times we had was the drift snorkel* trip we arranged through the activity desk at our hotel, mentioned below, do it. It’s a blast, you feel as if you are flying through the pass. Even in the rain it was great and the two men who run it are wonderful! The water was about 81 degrees, warmer than the lagoon when entered from our hotel. Diving was great and being down at this end of the motu made for a quick 10 minute boat ride before we were in the water. Just about every other dive in Rangiroa we encountered wild dolphins. 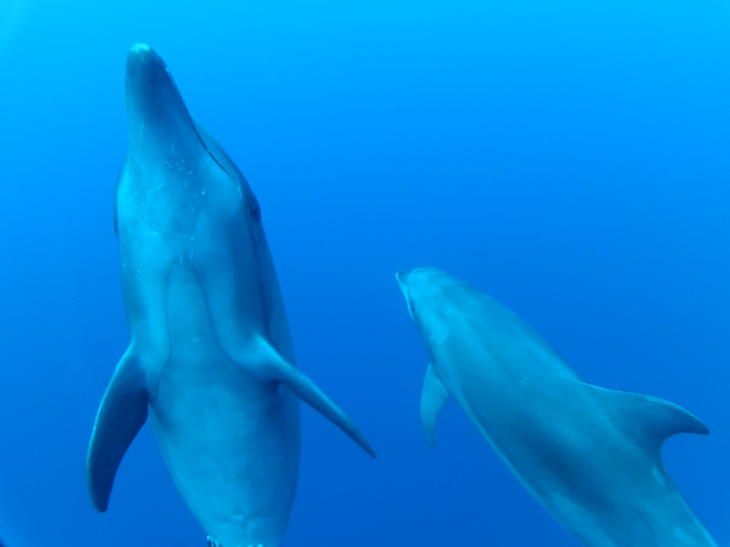 These dolphins were used to seeing divers and at times would hang around wanting to play. The coral is beautiful – so alive and full of life. 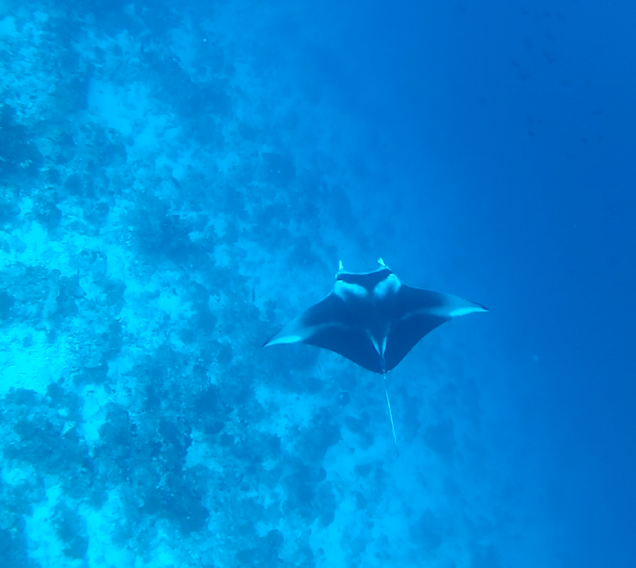 I saw big schools of Barracudas, Napoleon Wrasse over 3 feet long, a hug Manta Ray, Spotted Eagle Ray, turtles, moray eels and such a large variety of funky fish that I could spend all day trying to name them. *Underwater we spotted all these during our snorkel trip except for the dolphins. Expensive!! The property is beautiful and this place has lots of potential but I feel it was 5 star prices for a 3.5 star hotel. We stayed on over-water bungalow which had all the amenities expected for the price: Flat screen TV, Ipod dock, safe, shower, tub, bathrobes, towels, free internet. These rooms were recently remodeled. We extended our stay and moved to the beach bungalow. It looks like parts of the rooms had been remodeled, mosquitoes and ants can be a big problem! The front doors, unlike over-water rooms, have a gap at the bottom inviting the pests in. Note on toiletries: Conditioner isn’t great for swimmers w/ long hair I suggest you bring your own. If its marine life you hope to see from your over-water bungalow, don’t expect much here. There aren’t man made corals under the glass here as in hotels like Bora Bora. That said, snorkeling in the lagoon here is good with a variety of fish and some nice coral. 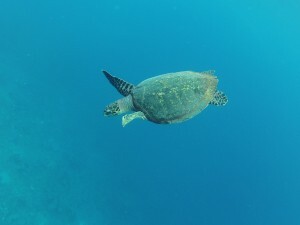 However, due to windy conditions some days the water was too cloudy to snorkel. Ahh the restaurant. Let’s just say the staff didn’t have the same sanitary training as the housekeepers, who were so thorough, ours even pulled out the bed to clean behind it. Service in the restaurant is excellent, quick, and fast. We reported issues that we had to the GM, and they appeared to be immediately dealt with. Food was ok. Breakfast had lots of buffet options but also lots of flies which turned me off so i stuck to ordering eggs or cereal. The dinner barbecue, mostly fish was also an uncovered buffet so flies again presented a problem for me. A la carte the meat was really good as were the noodles at lunch. The fish was too fishy, indicating it wasn’t very fresh so we just stuck to meat & pasta. Desserts are the highlights, every one was amazing. Overall, the staff was very hospitable and helpful. The grounds are beautiful. Its a comfortable place to be with many things to do nearby and a few good places you can walk to for lunch. Wifi is free. But remember, you pay 5 star prices for a solid 3.5 star hotel. A lot of it is form without the substance. One of the best times we had (twice) was the drift snorkel trip we arranged through the activity desk. Bikes are for rent. Good location to do the best thing on the island, take a right out of property and walk about 15 minutes around 4pm and go to the public beach area or Josephine’s dock…the dolphins will give you an amazing free show as they jump and play in the waves. Dive shop on property is convenient but they are always running late, so expect to waste some time sitting around the shop until your dive departs anywhere from a half hour to an hour late. That said they were experienced, friendly and helpful. 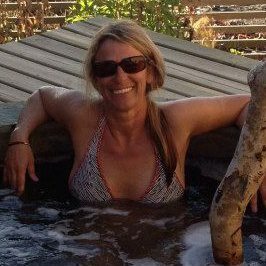 I don’t usually write this but I loved French Polynesia so much that there will be a next time, and when I go it will be to Rangiroa and Fakarava. I would probably stay at the pension and consider using the 10 dive pass offered by the independent shops on the various atolls. This time I used Top Dive for all my location and overall it was a good experience. Yet some of the smaller dive shops are owner operated and if you read my Fakarava page you will see how that can make a huge difference.